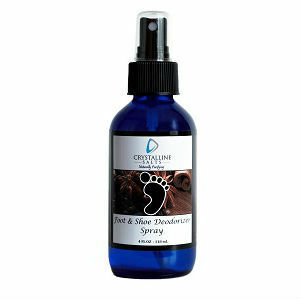 The following is a review for the Foot and Shoe Deodorizer Spray which is manufactured by Crystalline Salts. The spray claims to both prevent the growth of bacteria that causes odors on your feet and in your shoes. Read on to learn whether this spray is right for you. All of the essential oils included in the ingredients are organic, non-toxic and BPA free. This product is also free of paraben, alcohol and aluminum chlorohydrate. The Ammonium Alum claims to prevent the growth of the bacteria. This is a popular natural alternative to chemical deodorants. Baking soda has long been used as a natural deodorant. Eucalyptus, cinnamon and clove oils are popular ingredients for natural deodorants because they claim to stunt bacteria growth. Clove oil is often used to solve problems with upset stomach as well as toothaches. One of its chemicals may possibly decrease pain. Eucalyptus oil is used for many purposes but often for respiratory infections such as asthma and bronchitis. To use the spray, spray on both your feet and the insides of your shoes. If you are allergic to any of the ingredients in the product, consult your doctor before use. Consult your doctor before using this product if you are pregnant or breastfeeding. Cinnamon oil is known to cause premature labor or contractions in some women. Rosemary oil is toxic if it is ingested so use the product according to the manufacturer’s instructions. Eucalyptus oil is probably unsafe for use in children, consult your doctor before you use this product on your child. A bottle of Crystalline Salts’ Foot and Shoe Deodorizer Spray costs $16.99 and is available from the manufacturer and Amazon. Amazon lists the bottle as being four ounces. However, the manufacturer’s site lists the bottle as being eight ounces. It is not clear what the dosage for this product is or how long the spray will last. Crystalline Salts offers a money back guarantee if you discover that the product does not satisfy your needs. However, on Amazon it is noted that returns will not be accepted if it is discovered that the safety seal is broken. The reviews on Amazon have mostly been positive but they seem to be from people who are looking for deodorant. Foot and Shoe Deodorizer Spray is manufactured by Crystalline Salts and claims to be an all natural deodorant for both your feet and shoes. All of the ingredients are natural or organic and the product says that it is non-toxic, hypo-allergenic, free of chemicals and not tested on animals. While the product is a natural treatment, both the price and the guarantee are unclear. Amazon and the manufacturer’s website state two different things and it is difficult to know how much it costs or if you can return it. Also, this product does not seem to be designed for people who have odor from fungal infections, like athlete’s foot. Jimmy Rodriguez	reviewed Crystalline Salts Foot and Shoe Deodorizer Spray	on June 14th	 and gave it a rating of 2.5.